Home>News & Update>We Came From Nothing! Sidekick is back on top! Black belt kickboxer Daniel Knight, describes how the company started from nothing and rose to fame. Daniel graded as a black belt in kickboxing in his home town of Brighton and competed on local events. Daniel had no involvement in the pro kickboxing circuit and to be a part of it was his passion. 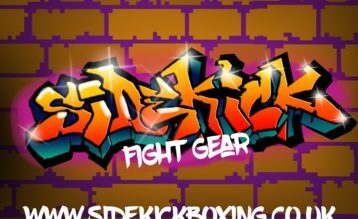 Sidekick was founded and within a year the brand was endorsed by some of the best kickboxers in the UK. The popularity of the brand grew so fast that even though Daniel had never trained in MMA he had a strong link to it. The brand was seen live on terrestrial TV, worn by Alex Reid. Sidekick went on to sponsor MMA promotions like CSMMA, FCC and BCMMA and fighters on Cage warriors, BAMMA, Bellator and the biggest global show for kickboxing Glory.